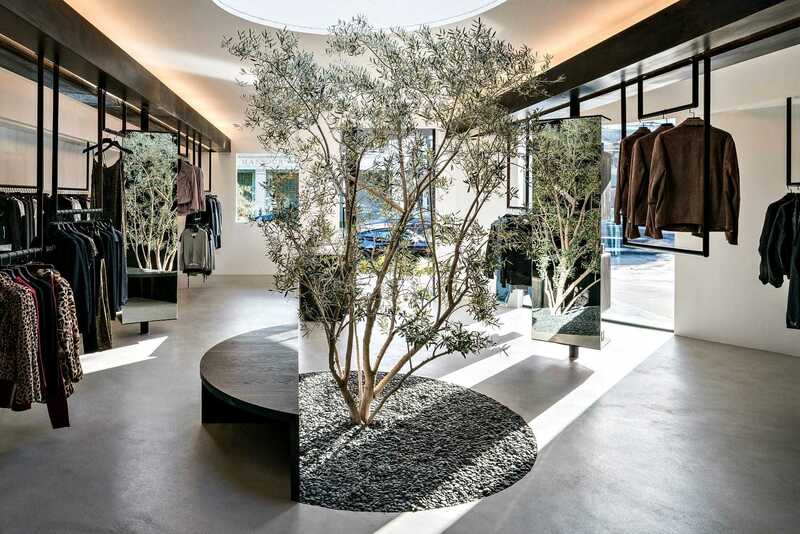 Dan Brunn Architecture unveils the new flagship RTA boutique, where an olive tree garden by landscape artist Hitoshi Kitajima takes center stage. 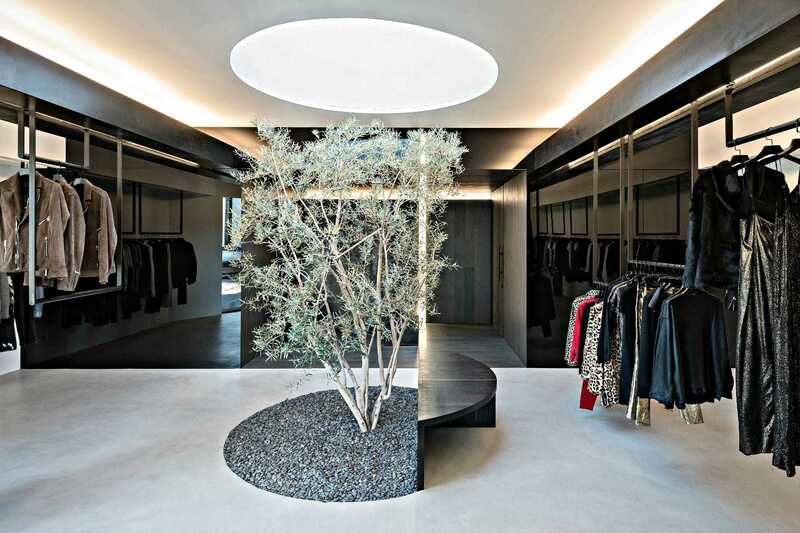 Dan Brunn Architecture recently unveiled the completion of their renovation of the flagship Los Angeles Road To Awe fashion boutique in which an olive tree takes the spotlight. The architecture firm worked with Japanese landscape designer Hitoshi Kitajima. The olive tree was planted in a patch of gravel and grows upwards towards a round skylight in the 1970s Melrose Avenue store. The architecture firm wanted to create a sense of wonderment in the space so they teamed up with the landscaper to create the patch of nature within the designer building. Added to this effect is a pair of spinning display mirrors which reflect the tree, enhancing the natural setting and serving as shelving with custom wood boxes at the back of the mirrors. The setting is inviting, playing to our desire to seek natural surroundings. A semi-circular bench is placed below the tree, where customers can sit and view palm trees on the outside, which can be seen through the skylight. The rest of the store is a minimalistic setting with open spaces, wooden surfaces, white walls and concrete flooring. Clothing hangs around the garden from blackened steel beams which hang from the ceiling. The dark panels and sharp edges complement the spotlighted tree by creating a dark contrast to the setting. This is only broken by a single strip of light that runs up the wall, forming a cross with the ceiling; which serves to represent the “T” in the RTA logo. “At the space’s midpoint, an imaginary line created by the sales desk and the slab bench appears to ‘slice’ a circular seat, creating an alignment with the edges of the other furniture,” the designer explained. Dan Brunn Architecture has been designing and developing commercial and residential projects around the world since 2005. The company “prides itself on crafting architecture that respects the site and provokes a sensuous interaction with the environment,” as is evident in the boutique space.